“Lighter, quicker, cheaper:” three words to sum up a revolutionary, low-cost, high-impact strategy to development, one behind all of Eric Reynolds’ projects at Urban Space Management (USM), a firm known for driving the economic renewal of run down or under-utilized spaces in imaginative and cost effective ways. Reynolds urges a movement away from "mega-schemes” which make development unsustainable because they require long time frames to assemble large sites, large teams and large sums of money- all of which can be risky in today’s volatile economy. Eric and his business partner, Eldon Scott, promote and use an entirely different development model; one that is lower risk and lower cost and which can be an interim solution for a site that is in transition- techniques especially relevant to the thousands of evolving post-industrial waterfronts around the world. Eldon used Urban Space Management's approach in his work setting up the Union Square Holiday Market in New York City. 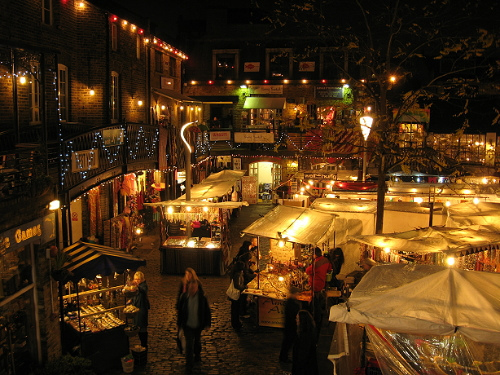 Urban Space Management's Projects (which include Camden Lock, Gabriel’s Wharf, and Chelsea Farmers Market in London, and several seasonal markets in New York City) have not only been able to not only “catch the moment” but also have created greater profit per dollar of capital expended than other, traditional development schemes. Last June, Eldon Scott shared USM’s unique approach at a PPS Forum attended by developers of Public Multi–Use Destinations at Granville Island in Vancouver, British Columbia. Eldon shared his years of experience on how a combination of creativity and local talent can be used to add uses to a site and make money in the short term, even in small spaces. USM brought in set designers to add colorful facades to concrete structures at Gabriel's Wharf, a former parking lot. 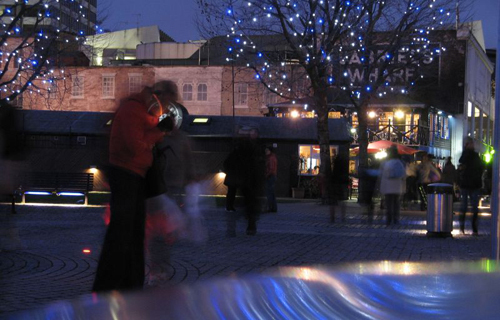 Gabriel’s Wharf, now one of London's thriving public multi-use destinations, was just another parking lot until USM asked a set design company to create colorful facades to decorate the concrete garages already present on the site, transforming them into studios for local artists who began displaying (and selling) their creations. The same concept was used at other USM developments, including The Chelsea Farmers Market, located off Kings Road in London: USM began by adding temporary structures, both timber and re-used containers, to keep costs low and attract an interesting group of tenants. USM uses the concept of a “Coral Reef” in their development practices. In other words, for USM, high design is not the focus. The color and vibrancy of their developments come from the tenants and visitors who occupy the space. Eric spoke at PPS' Waterfront Synopsis Conference, Sept. 15-17, 2010 in Stavanger, Norway. PPS has worked with NUDA to compile the proceedings from the event.